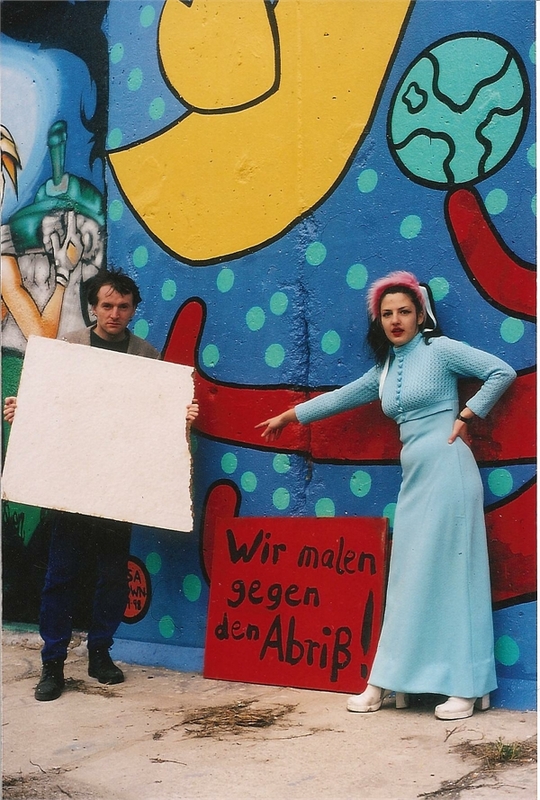 Lisa Brown was the only Canadian artist to paint on the Berlin Wall. 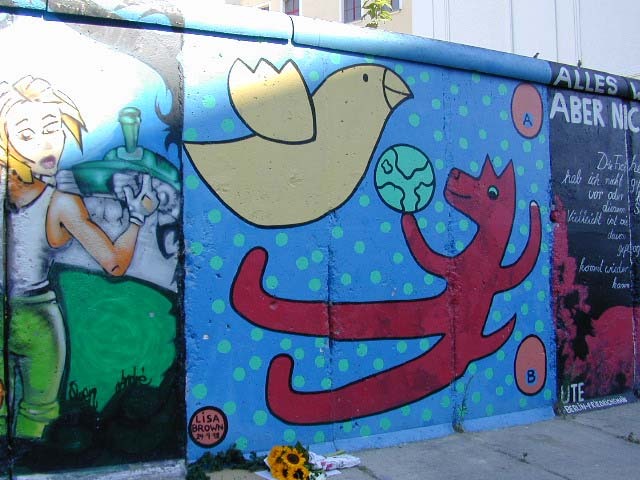 This section of the wall is now housed in the Agricultural Building in Berlin. "My symbols are the dog, the bird, the “A” and the “B,” and two eggs with a world in between them. 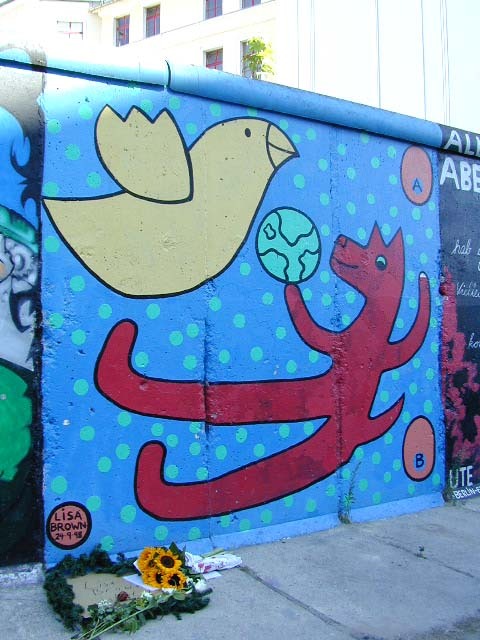 The yellow bird represents freedom and the red dog is the protection of that freedom. The world that comes between them is the glowing green orb. It represents my world, the world that I see through my eyes and portray with my heart and my hands. Side by side, we live here together, learning from our mistakes and trying not to repeat those past. The egg incubates life before it is born, as the artist incubates ideas before they are accepted into society. The “A” stands for the primal, the unity, the one or the alpha. The force that makes an individual, but through which we are all connected—inside, where all ideas are created. The “B” represents the other, the unknown or foreign, the opposite or complimentary. It is the two, the separation, the group or the couple. It is the reaction to the action that creates movement, back and forth, oscillating and riveting, making the world go round. The floating green dots in the background make up a field of unattached atoms, an idea in the process of becoming, or the potential of any given new idea. As I stood on what used to me a no-man’s land, it made me think about all those that fought for the freedom I now enjoy and protect. Worlds apart or lost in space, here we are, still trying to get along. It’s not by erasing history that you will learn from it. To be able to accept the past is to create the future. Germany would be smart not to let the big businesses of Postdamer Platz destroy this last symbol of freedom, only 10 years ago, the birth of the reunification. I am honored to have been chosen to represent my ideas about freedom and change. 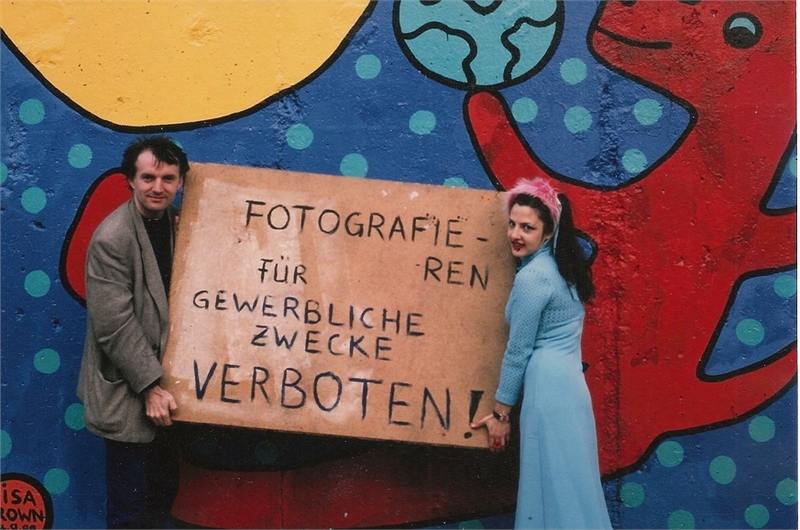 We must protect the memory of the Berlin Wall today or tomorrow it will be gone."